Looking for something simple to prepare the next time you’re entertaining your tots to teens-toting friends or family? Grilled pizzas are the way to go. Relatively inexpensive (well, unless you’re into artisan or organic ingredients, which if you’re a Philly foodie is very likely), healthy and easy to prepare (we won’t tell if you use store-bought dough! ), it’s a safe bet everyone in the house—or backyard—will be fighting over that last slice. Making the dough is the toughest part of the prep, but it is a worthy endeavor. Plus, the whole family can get involved. (Just don’t forget to make two days ahead.) There are a lot of good recipes available online and on bookshelves, but one of my favorites is from Martha Stewart, whose flaky, buttery, thin, crispy pie crusts have repeatedly made me a kitchen hero over the years. Whether savory or sweet, her technique has my vote. As you’ll see via the link, this recipe yields four mid-sized pizza crusts (much easier logistically, trust me) and doesn’t rely on you being a master dough thrower. Which in my case, is a great asset: Getting a uniform, hole-free ROUND canvas is always a challenge; even my 14-year-old puts me to shame. However, when it comes to toppings—in this case five different family-friendly pies—I’ve got the upper hand. 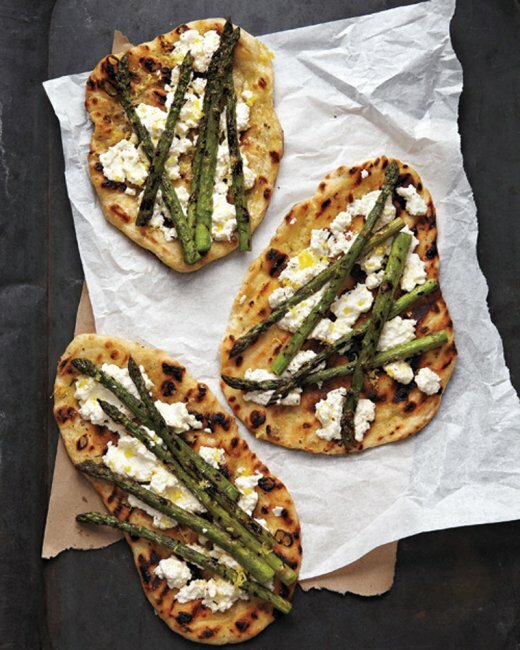 To stay within the What Would Martha Do Theme?, here’s a link to her asparagus and ricotta grilled pizza that spells out the actual techniques for stretching, shaping and grilling the dough. It also makes a fine companion to a hefty slab of grilled salmon. Since you’ll be entertaining a crowd of families and the yard or house will be loud and frenetic, the last thing you need to do is worry about precision. Once you’ve nailed the dough prep, everything else should be a downhill ride. Which means, for those of you who like exact measurements, give it up. For the larger ingredients, like meatballs, pasta, chicken, arugula, ground beef, grated cheeses, eyeball about 1 1/2 cups of each topping, per pie, and you’ll have plenty. Then with anything you have leftover, you can build a “kitchen sink” pie. Figure about six to eight ounces of grated cheeses (mozz, jack and cheddar) for the combos listed above, but again don’t sweat it if you have too much. Pizza making is a great segue into frittata making the next morning. Just add eggs. For the actual grilling, I also like Alton Brown‘s (Good Eats) explanation. Easy to follow and ensures that the toppings get warmed up a bit. Ideally, you want another work surface next to the grill and a large cutting board to place pizza on during transitions, that also fits your ingredients for whichever pie you’re creating. Oil the grill grates and decrease the heat to medium. Brush the dough with 1 to 2 teaspoons of olive oil and flip onto the hot grill. Close the lid and cook until the bottom of crust is golden brown, for 1 to 2 minutes. Close the lid and cook until the bottom of crust is golden brown and the cheese has melted, about 1 to 2 minutes. Using the peel, remove the pizza to a cooling rack and rest for 3 minutes before slicing. And now… for the rest of our party throwers… lots o’ links! YUM! I like all these ideas and options! Thanks for these tips on grilling pizzas! I LOVE grilled pizza. I’m always looking for different combinations that I think the kids will like. Thanks for the inspiration. Grilled pizza is the best! Thanks for some new ideas!! I LOVE grilled pizza and wish the rest of the family felt the same way so i could make it more often. Bacon, Corn and Cherry Tomatoes sound so good. great ideas! Realized that I was sitting on some pretty tasty recipes over here on the day gig’s blog, so I decided to share the deliciousness. As you’ll read, this post was originally part of a virtual dinner party experiment by a group of Philadelphia Social Media Moms bloggers. There are a number of interesting, easy-to-prepare and family-friendly recipes to click through, so enjoy. And, if you’re up for a virtual dinner party and have room at the “table,” I would be thrilled to join in the fun.